And so, the Scary Boss Lady returned triumphant from her travels in the cold, cold North. 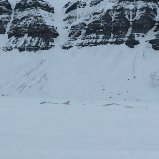 She had seen a polar bear, she told me. I presume she learned some stuff about eyes as well. I forgot to ask if the polar bear had healthy corneas, but I’m sure she would have mentioned it if it had needed treatment. She did bring back some pictures. This is my favourite. The hand belongs to Dagny’s husband Sondre, so that is a pretty big paw-print. The actual photos of the bear are very distant, but the place looks stunningly beautiful. 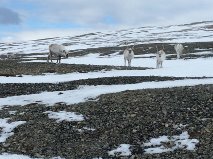 And they did see some Svalbard reindeer. Meanwhile, back in the real world, the weather has been quite warm some days this week. So much so, that the first of this year’s flies appeared in the clinic. I couldn’t find the fly swat, so when the evil menace entered the operating theatre, I had to create a cunning fly opening by propping the doors outwards to encourage it to remove itself. Happily I didn’t make the same mistake I made last year when I announced to Dagny and Magne that there was ‘et fly’ in the room. They managed to keep straight faces, despite the fact that I had just told them there was an aeroplane buzzing around their heads. A fly in Norwegian is ‘en flue’. It’s an easy mistake to make. Tuesday was a good day to forget my lunch. As sometimes happens, I remembered about five minutes into my journey that I had left it lying on the side in the kitchen at home, and as I never set out with more than five minutes to spare, there was no time to retrieve it. Fortunately there was a rep in from Bayer, who brought the usual inducements to buy their products in the shape of a few sandwiches and a bowl of chocolates. It’s good that big pharma likes to spend so much in bribes. Actually I had to laugh the other day when I realised the pen I had in my pocket was actually a Vets Now pen, presumably purloined from some conference or other. Those things get everywhere. It was a nice reminder of a happy past. Thursday saw Wivek carrying out some major dental work on a dog. As we don’t have gaseous anaesthesia in the dental room, we often rely mostly on deep sedation for doing dental work, but as she was potentially going to be working on the animal for up to three hours, she wanted something that would remain reliably stable for much longer. She therefore used the new infusion and syringe driver to give a complex mixture of anaesthetic and pain-relieving drugs and we used the new oxygen pump for breathing. It all worked like a dream. I monitored the breathing and pulse for her and she achieved wonderful stability. I have always been a big fan of gas anaesthesia, but I could definitely be converted. I had a slightly bizarre experience on Thursday. The washing machine and tumble drier are in the changing room area of the clinic, as is the toilet. As I stood unloading the machine and folding up the clean washing, Jan-Arne rushed in. ‘I have to go to the toilet,’ he said with obvious urgency. I took some of the uniforms through to fold them up in the next room as I had no great desire to listen, but the next moment, I heard the skirl of bagpipes emanating from behind the door. For a mind-blowing moment, I wondered whether Jan-Arne was actually Scottish. After all, only a true Scot could possibly blow that kind of noise from his bottom. But then it dawned on me. ‘Are you using your iPhone in there?’ I asked. ‘Oh yes,’ he said, obviously perfectly happy that I was there. Men are strange creatures. Towards the end of the day, I was chatting to Dagny and she was trying to send me her is-bjørn photographs. It was taking ages (maybe Jan-Arne was on the toilet again). Marita walked in. ‘I just had a telephone call from a boy, wanting to know how long it would take for a rabbit to get pregnant if the boy rabbit and the girl rabbit got in together. I told him about five seconds,’ she said with a grin. Dagny put her head on her side. ‘Oh no,’ she said. ‘I don’t think that’s right.’ She paused for a long moment for effect. ‘Not SO long as that,’ and we all laughed. It was the perfect end to a very pleasant day. This week’s picture is of Jan-Arne’s dog Susii Because he chats to his clients enthusiastically about his own pets, those who have similar dogs tend to want to see him again. It always amazes me how many cute little brown dogs make their way onto his patient list.